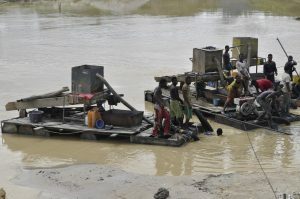 Mr. Joseph Frimpong, Mines Inspector of the Inspectorate Division of the Minerals Commission (IDMC), says there is a need to re-organise small-scale mining operators into viable co-operatives with the requisite level of modern equipment and some concessions earmarked for them to operate under the close monitoring and supervision of government agencies. Mr. Frimpong said this when making a presentation at the end of a three-day sensitisation workshop organised for stakeholders at Akim Swedru in the Eastern Region. The workshop was under the theme “Mining, the Environment and You: The Stakeholder’s Responsibility”. About 350 mineral sector stakeholders from the communities, miners, Regulators — Mineral Commission and Environmental Protection Agency (EPA) — Local and Central Government, Civil Society Organisations and NGOs, attended the programme. Participants were taken through minerals and mining regulations – general, support services, compensation and resettlement, licensing, explosives, health and safety. Mr. Frimpong indicated that every quality mining should be in equilibrium with respect to socio-economic and environmental standards. Mines Inspector of the IDMC Mr. Joseph Frimpong implored NGOs and Donor Agencies to support the formation of environmental management advocacy groups, to enable them administer moral pressure on communities who damage the environment with their economic activities. Community Liaison Officer, Daniel Kwabena Ewur of the ROCHA Ghana, an NGO, was emphatic that implementation of an environmental management system focused on continual improvement to review, prevent, mitigate or ameliorate adverse environmental impact is necessary. Mr. Ewur urged the Minerals Commission to help facilitate the formation of a forum, or a standing platform comprising all the major stakeholders, so that committees can be formed to follow up and ensure the implementation of each stakeholder’s responsibility. He was of the view that illegal miners who are of school-going age can also be encouraged and supported to go back to the classroom and learn how to become productive and useful citizens in future. The chairman called on the Mines Commission and the Environmental Protection Agency to organise periodic training workshops to sensitise and build the capacity and legal knowledge of Civil Society Organisations, especially in environmental law and legal processes.